We are loving this compilation YouTube user faireset2 created, which works to prove the theory that a secret society of ninja cats exist among us, and are obviously hiding in plain sight. Take the time and check out GEICO’s thirty second ad that features an anxious couple who decide on an unorthodox choice for a home security system. And do not drink a beverage while viewing it. 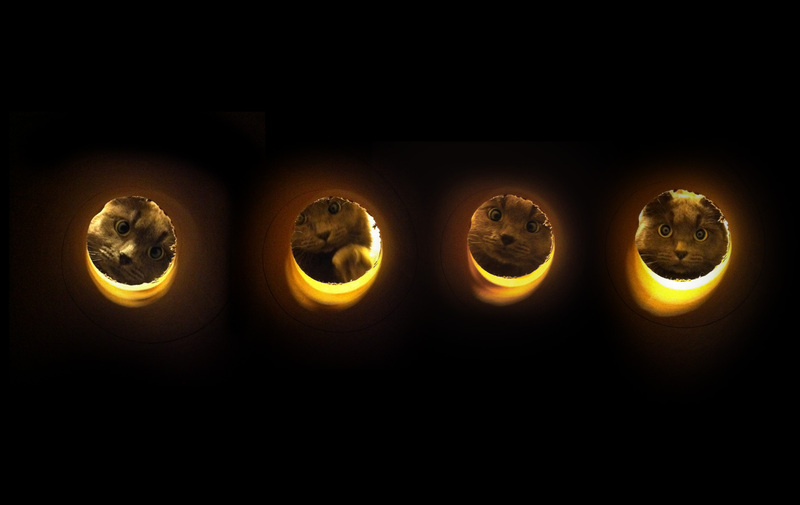 By shooting pics of his cats from the end of a paper tube, Redditor brokenstraw captured some great photos which make it look like his kitties are staring through a portal. Wallpaper here and here. Sometimes it’s hard to remember which typeface is which, so the guys over at Sad and Useless have assembled this handy guide to fonts, accompanied by cats. Comic Sans cat is our new best friend. Despite their size, cats are usually seen getting the upper hand. But put kitty up against this fluffy rooster, and the tables are suddenly turned. Also, proof positive that a good soundtrack is everything. 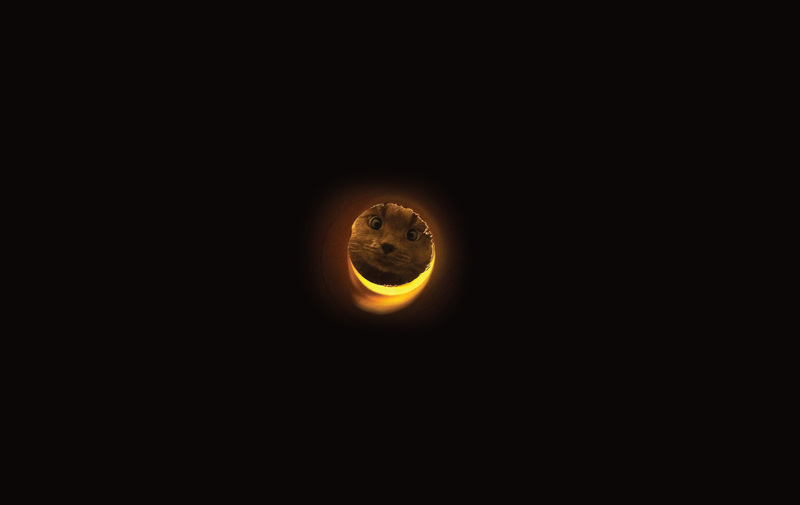 One thing is certain – the internet loves cats. There’s even a meme about a very long cat. This is not that cat. This kitty just has a really long tongue, and an amazing amount of tolerance for its owner. The master of chillaxing gets something a little more sophisticated than his usual cardboard hangouts. We could watch Maru climb up and disappear into that tiny house all day. Image enhancement engineer Brant Widgeon helps bring us awe-inspiring astronomical images. But he doesn’t just have to clean up dust and specks – he’s got a much bigger challenge on his hands. We already know there’s an art to climbing and descending stairs (and escalators). But as is often the case, cats do things very differently, as is demonstrated by this feline’s unusual ascent. We laughed at this one’s hypnotize-then-attack tactic. This kitten’s version is far more diabolical. We’re starting to see a trend here. Damn cats. We hope YouTuber moongrate is okay. Maru loves boxes. Sashimi on the other hand loves boxing. And scratching and scaring the hell out of YouTuber Soejima, despite all efforts to make peace with the cat. On Earth what will you do? We’re not sure what sort of evil ideas this cat has rattling around its furry little head, but all we know is that from the way it’s staring at us, no good can possibly come of this. Another case of cat bullying caught on camera. This actually happened to us when we were kids. Bruises all over. Not cool, cat. Fortunately the victim here didn’t share our fate and wasn’t injured. We’re not sure what the original Begging Cat wanted, but this kitty is pleading for your help too. Either he wants the fried chicken in your hand, or maybe little Timmy is trapped in a well. For some strange reason, this guy likes to stack random crap on his cats. Usually, they seem completely tolerant of this humiliating exercise, but we guess they draw the line at silly party hats. The first feline nanny we saw was really patient and tolerant, but Stewie the cat takes a more active role – he uses his mystical cat powers on a crying baby to put the young one to sleep. The December weather’s got us feeling sluggish and sleepy, but it looks like it’s done that and then some to these cats. A stupid video for a sleepy Sunday by YouTuber theindiemachines. Try as it might, this Roomba can’t shake the cat going for a ride on its back. Our cat would go flying across the room the second this thing moved, but this cat seems happy to have a chauffeur. Remember the hair dryer-fighting cat? His name is Oskar; he was born without formed eyeballs and thus can’t see. Here’s Oskar when he was 8 weeks old, getting his first toys – balls with bells inside. Two cats enter, one cat leaves. Or something like that. Watch as these two feline opponents work on their best pro-wrestling moves in the SmackDown ring. Let’s get ready to… awwwwww. Hello? Yes, This is Cat. Fred is one smart kitty. One smart douchebag kitty. He figured out how to make the phone stop ringing. Sooner or later he’ll just cut the cord. Of course, he could actually be waiting for a call. It’s more like Welcome to WTF City, but don’t be a ‘fraidy cat. Some furry friends are here and more than happy to take you on a drive through the glorious metropolis they call home. A single purpose tumblog that revamps classic album art… with kittens. We can’t decide if we like the BjÃ¶rk or Devo cover best. Though Nevermind is pretty great – that cat isn’t wearing any clothes! This cat finds itself in a precarious situation and has to do a high-wire crossing through the laundry room. While kitty starts out strong, we’re not calling Cirque du Soleil anytime soon. Despite the fact that cats can occasionally be trained like dogs, most of the time they’re way too stubborn and self-centered to do the bidding of us humans. There’s a reason you don’t walk cats. While dogs are pretty good at learning tricks, we’re impressed that any cat will take this much direction. Richie, the kitten seems to thrive on the whole training thing. The secret? Sausage treats.